Pros: Simply the finest quality industrial tricycle on the market. The Husky T-326 has a heavy duty oversize frame that has beautiful quality TIG welds and smooth consistent paint. The rear axle is the thickest on the market which gives the T-326 a 600 Lbs. capacity. The large 26″ wheels roll very well and come with super thick eleven gauge heavy duty spokes. The T-326 come with a wide comfortable seat, heavy duty inter tubes and wide puncture resistant tires. The T-326 can be outfitted with a rear basket, platform or lockable cargo box. The T-326 can be shipped unassembled by Fedex or UPS or fully assembled by Semi truck. Pros: True Bicycle painted almost everything that can be painted on this trike. Many of these industrial tricycles see a tough life. Many of these tricycles are at businesses where they are left outside in the weather 365 days a year. I visited a resort in the Caribbean and they use industrial tricycle for their staff. You could tell the trikes were fairly new but simply looked well aged because the salt air just ate all the chrome off the basket, handlebar, rims and other small parts. This is where the True Bicycle Carry All distances themselves from all other tricycle brands. The paint on all these parts will keep the Carry All looking better than other brands years from now. The rest of the trike is similar to other trikes on the market, oversize frame tubing for strength and heavy duty wheels. The rear axle is thicker and stronger than most other brands and the Carry All can carry up to 500 Lbs. The Carry All comes with a wide comfortable seat with springs and wide puncture resistant tires. The Carry All can be outfitted with a rear basket, platform or lockable cargo box. Pros: The Atlas Transit brings safety, durability and stability to everyone who rides this well built trike. 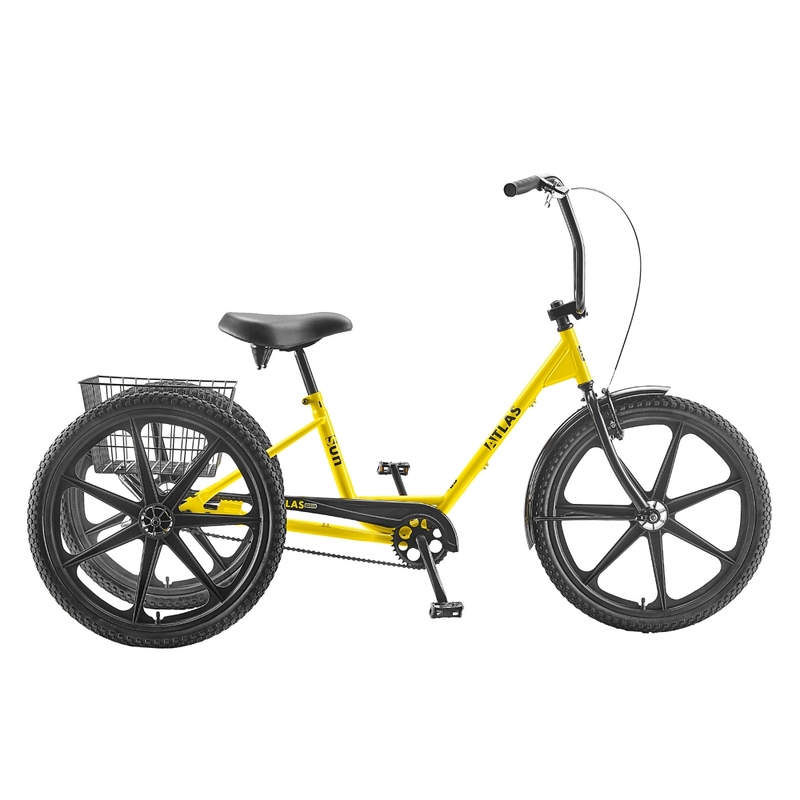 Features sealed crank, headset and rear axle bearings, extra wide saddle with springs, heavy duty rear basket and three different types of wheel to choose from. The frame is Mig welded together and the construction is solid. The trike is very corrosion resistant, paint is applied evenly and consistently to not only the frame but the other parts as well. Pros: 500 Lbs weight capacity and strong sturdy construction for a very reasonable price. The frame is built with oversize steel tubing and come with a reinforced steel deck capable of hauling 250 Lbs. Wheels are heavy duty steel with 12 gauge spokes and heavy duty tires and tubes. Paint is strayed on evenly and consistently and you can have any color you want as long as it is safety yellow. Cons: Only one wheel option the heavy duty steel, only available in safety yellow.